I’m so nuts over this coconut juice! You put the lime in the coconut and shake it all up…..
sing along with me, you know you want to! In my house, we are coconut crazy. We use coconut oil for absolutely everything and it is so nutritious, and aside from water – coconut juice is all we drink! 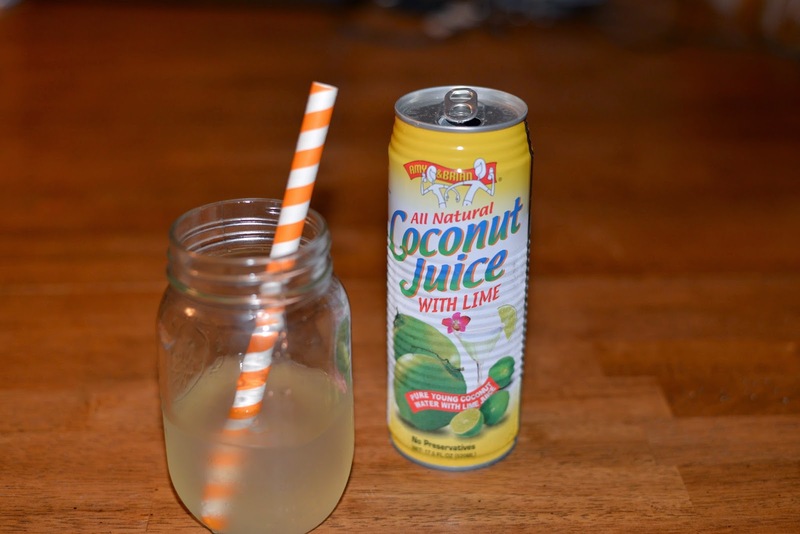 I recently tried Amy & Brian’s Coconut Juice with Lime and I am totally hooked! 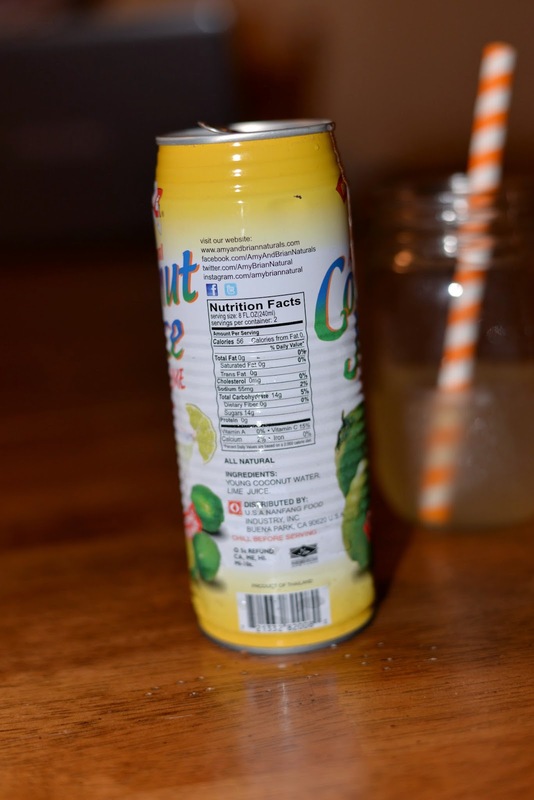 This refreshing juice tastes just like limeade and my whole family loves it. I poured my first glass today and shared it with my kids – who drank it gone and asked for more! I just placed an order to stock up our pantry. What’s so awesome about coconut juice (or coconut water) you wonder? I am so excited to tell you. This potassium rich treat is so crisp and refreshing, full of nutritious benefits and a total miracle drink. It’s packed full of electrolytes and so much better for you (and your littles!) than traditional, sugar-packed juice drinks. I am so pleased that Amy & Brian Naturals confirms that their product is grown and produced free of GMOs and pesticides. This is very important to my family! They also use a method called flash-pasteurization which is the best way to go, maintaining all of the nutritious benefits for us! I also love supporting small family businesses, such as this. I am so excited about this product and I wont think twice about offering this wonderful drink to my children! They loved it as much as I did. In addition to the Lime flavor, Amy & Brian Naturals offers a traditional flavor and one with pulp. You are sure to find one that your family loves! One can is enough to give both of my children a beneficial serving! Awesome deals on your future favorite drink, here, here, and here. Embrace Women. Trust them. Believe that they are in the right place at the right time. Know that just because something is right for you and your family, it’s not always right for them and theirs. Every Mother has the right to close her eyes and just listen to the voice within her. As long as she is doing what she believes is right, she is doing the best she can – and that’s the right thing. Ladies, stop comparing yourselves. You’re amazing. If you want to learn and grow, that makes you even more amazing. Know that others have something to offer you, and you have equally as much to offer them. We are all unique and beautiful. Let’s share our real selves with one another, and grow. Love. Support. I believe that sharing your smile with strangers brightens their day. I guarantee you that genuine people notice your smile instead of whatever handbag you have draped from your body. So, you’ve all heard of Life Hacks, right?? Well, here are your Mom Hacks. Because being a Mom is hard enough! Dinner for Breakfast?? Well, not exactly. Chances are, you prepare some sort of breakfast on a daily basis for your family. If you are anything like me, you cook and serve breakfast for a house full of people but don’t eat any of it! So, you can prepare dinner and breakfast at the same time, and finish it up while everyone else eats! You can use the same pans, and have all of your dinner dishes done before dinner time! Just prepare everything, put it in a dish in the fridge and don’t forget to stick it on the stove or in the oven to cook. Easy way to get an awesome jump start on your day. Activity Bins Put together some small bins full of activities that you can pull out during times when you just need a few minutes to finish something up but your kids’ toys aren’t keeping them busy anymore. Don’t overuse these unless you have a huge selection so they don’t lose their clout! Call your kid! Ever notice your kids don’t need your attention until you get on the phone? Well if they are ignoring you, give them a “phone” (which of course can be anything they can hold up to their ear and pretend with) and call them. I have tried this. It works. Find the treasure! Need your kids to clean up their mess?? Hide 1 treasure per kid that you have beneath the chaotic mess and tell them to find the treasure! Cleaning becomes a game! ……A video of Mom Hacks will be released in September! Be sure to follow us on facebook and twitter to be the first to get a link! I remember the good ‘ol days, cruising around in my little covertable with my girlfriends singing “Everyone’s Free” by Baz Luhrmann. I loved that song. Most of his advice I like, but that thing about sunscreen – well, he and I need to talk about that. MAINTAIN OPTIMAL VITAMIN D LEVELS all year round. Here are some great options to explore when trying to decide how to make sure you are getting enough D.
So, there are some skin types that are just prone to sunburn even if you have sufficient vitamin D levels. (We will talk about D in another post, but the recommended doses from the FDA are laughable). In this case, it is super easy to make a DIY sunscreen to protect even the most delicate of skin. Here it goes. Brace yourself, it’s easy! Pick an oil: Coconut or grapeseed. Mix it with 1/4 zinc oxide powder 3/4 oil. Apply to skin. Now, if you choose not to take my advice or if you feel like you simply must have sunscreen, please only buy Badger! I trust Badger Baby and Badger Sport. Choosing safe sunscreen isn’t just about protecting yourself from skin cancer. Those sunscreen items are packed full of tons of other toxins that can just stay away! I am a huge believer in Mommy’s intuition. I knew something was wrong with my baby, even though everyone around me was telling me that nothing was. I am so glad that I didn’t listen. After 6 weeks of my newborn son never looking at me, not responding to movement and stimuli around him, not showing clear response to light/dark (he didn’t even squint or blink from camera flash!) and not looking at my face – I couldn’t take it anymore. I took him to his Pediatrician who did some basic testing and determined that he may or may not have a problem, but I was encouraged to wait it out. I couldn’t. I was on the phone that same day, finding someone who would see him. Finding an ophthalmologist that will see a 8 week old infant that is not being referred from his PCP is not an easy task, but I found one. A few days later, we had our appointment. She didn’t give me any definitive information but agreed that something didn’t see right. She referred us as a stat referral to the Kellogg Eye Center to see a team of specialty pediatric ophthalmologists. He was examined by three Doctors at that visit. My Husband, 18 month old Daughter, 9 week old Son and myself sat in this office – waiting for them to come back. I can remember what each of us was wearing, I can remember every detail about this moment. The moment that the Doctor came back into the room and said we needed to be seen by a Pediatric Neuro-Ophthalmologist to seek treatment for our blind Son. Our blind Son. We were told that he had Optic Nerve Hypoplasia, which is a condition that has no known treatment or surgery to cure it. It never gets better, it actually gets worse. Every ounce of my being was heartbroken, thinking about my sweet baby boy and how he would never see me, his sister, his family. He would never see his future family or children, never have a favorite color, probably never ride a bike – the list went on and on. I was devastated for him. Completely shattered. Can you imagine holding your baby and having all of these new realities flood your mind? It’s awful. My Husband was staying strong for us. He reminded me that no matter what, we would give our Son an amazing life and always love him. Always. That wasn’t enough for me, I couldn’t accept this – but I was so thankful and humbled by my Husbands love that surrounded us at that terrible appointment and the emotional ride home. The Neuro-Opthamologist could not see us for 4 weeks. Four weeks. I was supposed to wait for 4 weeks to learn what the prognosis was for my sweet child? There is no way I could do it. I spent the rest of the night on the phone with offices trying to get him seen sooner. Shortly before 5pm, I got an appointment for the next day. I was hopeful that the Doctor would tell us that the diagnosis was wrong, or that we could do something. He just gave us more bad news, and told us that our son would never see. Never see. They said that though some children with ONH do have some vision, that our Sons optic nerves were completely gray – meaning that there was no chance of vision. Normal optic nerves are pink. They did not develop during my pregnancy. I refused to accept it. I wouldn’t listen. I gave up on the traditional doctors and started seeking alternative therapies. My best friend, and co-admin of this page, Rachelle, got me in that same day to see a Natural Practitioner that she works for that did a cranial sacral massage on my Son that same day. He told me that he felt some overlapping of plates in his skull and referred me to a massage therapist to get additional massages. The next therapist determined that he had a kinked nerve in the upper hemisphere of his skull that was most likely restricting bloodflow to his optic nerves- preventing them from developing. Three massages later, and I am 100% serious – my son looked at me. He made eye contact with me while I was nursing him – during which he would typically just be staring off into space. He was 10 weeks old. Every day there after, his vision kept improving. He began tracking objects, his pupils dilated in response to light – I knew he could see me. It was magical. We kept going with these massages that we couldn’t even afford but couldn’t afford not to. In addition to this, I began taking vitamins and nutritional supplements that are said to promote visual stimulation and healing. Because I was taking them, my son would reap the benefits through my breastmilk. I am so happy to report that my Son is now 2 years, 4 months old and has incredible vision. He can see items up close and far away with a very slight lazy eye that will be correctable via patching therapy. He may have a subtle color blindness but he is doing everything that I thought he may never be able to do. It’s incredible. I am crying as I write this, remembering all of these emotional days and celebrating the journey that restored his sight. He has since followed up with his ophthalmology team who celebrate right along with us that he can see. His optic nerves are now the perfect shade of pink! I have reached out to people who have found this treatment to be helpful for them, too. Spread the word, please. Be inspired. Know that you don’t have to accept anything that you are told that your gut is telling you otherwise. I encourage everyone to search high and low until they find an answer that they are at peace with, and I thank and love each and every person who helped my Son along this journey so very much. There is a permanent place in my heart for them, always. Read an email from someone our story helped, here. To all the Mothers who listen to their gut – to everyone in the world who reaches out to support, listen, and help – and to each and every one of you – cheers! A Thank You that changed my life! From speaking out, I have found a few people to share my story with. This email that I received a few months ago was life changing and has been the inspiration for me to keep going – and keep reaching out. Read on to see how this woman helped her blind grandson to SEE AGAIN. I thought I’d give you an update on our new, adopted grandson, ****. You probably remember our exchange in February about cranio-sacral therapy for children like your son, whose optic nerves didn’t develop properly. Our daughter and son-in-law got little **** almost two months ago now, and found that he can see fairly well with his right eye, but hardly anything with the left one. The left eye wanders, and the brain had pretty much shut it off. They were told to do patching, to strengthen the muscles in the left eye, but he was groping along (not complaining, sweet little guy) when having the patch on his good eye. And of course, glasses won’t fix the problem, as it is the nerves that aren’t developed that cause the vision to be so poor. When they were here at Easter my husband found a ridge down the middle of his head, going towards the back. I googled ‘suture ridge’, and the only good reason for it is bony plates that have jammed one over the top of the other, and of course, the only recommendation all of them had was surgery. Now they’ve found somebody in their town (Leamington, Ontario) who is a chiropractor, but he also has been doing cranio-sacral therapy for the past five years, and has been treating people with suture ridges (even though never a small child before). **** has had five adjustments so far (three times a week, and he adjusts his spine, too, and gives them a deal out of compassion of only charging $12.00 a treatment),and wouldn’t you know, he has just started tracking things with BOTH eyes together! I don’t believe he has been patching long enough for that result yet, I am positive it is the adjustments. So, now instead of a blind grandson, we might end up having one with perfect vision! I cry with joy every time I think of sweet little ****. I am attaching a picture of his family. My daughter is almost 34, her Husband is 36, Daughter will be 8 next month, Daughter will be 7 in July, Daughter will be 4 next month, and **** will be 2 next month. Thank you so much for the information you posted on the forum, and for the advice you gave me personally. Without you we would never have known what to do! Laundry Soap is so easy and affordable to make. It’s time to rid your clothing and bedding of toxins for good! You spend all of your day wrapped up in clothing washed with harsh soaps full of chemicals and artificial fragrances – then cuddle up to them in your bed at night! Packed full of skin and respiratory irritants, this stuff is mostly no good. Whip out a cheese grater and grate your soap. Im not kidding. It’s totally tedious but you’re going to end up with a years supply of laundry soap for about a penny a load. It’s worth it. Once you have your giant pile of soap shreds, mix everything together and put it in containers. Use about 1tsp for a small load, 1.5 for medium and 2 for a soiled load. Store your goods in a sealed container, away from little ones! Detoxing. What is it, and how do I do it? What is a detox? A detox is a regimen that you do for a set amount of days, that consists of some type of supplements, a supplemental shake and a clean eating plan. These things work synergistically to help rid your body of all toxins while giving it proper nutrition too. A good cleanse will give you a complete plan to follow, whether you want to do a quick cleanse (7 days ) or an extensive cleanse for up to 3 months. You choose what works best for you. Our health is one of the most important things! Without our health, our quality of life can be very poor. It’s very sad that we are not generally encouraged to take control of our own health, and take the time to understand what optimal health is and how to get there. Most of the time we take our health for granted until something develops and then we tend too switch from being proactive to reactive, but by doing so we don’t always make the best decisions. Thankfully, even after we develop health issues our bodies have the amazing ability to heal itself as long as we give it the proper nutrients to do so. A crucial step in maintaining our bodies is detoxing. A safe detox should be done a few times every year! This helps rid our body of toxins that would usually just continue to accumulate and eventually cause a plethora of health issues, some minor and some major. A proper detoxification program will help remove all toxins (environmental, emotional, etc). By doing this preventively, you will help reduce the chance of developing health issues in the future. If you already have health issues this will help your body to be able to function better and reverse them, without taking harmful pharmaceuticals. Recommendations for safe detoxing should always come from a qualified practitioner that is familiar with your current health and health history. We never recommend blindly beginning any detoxification program. We strongly urge you to do research on the Core Restore program, and follow us on a step-by-step journey if you decide that it is a good fit for you.